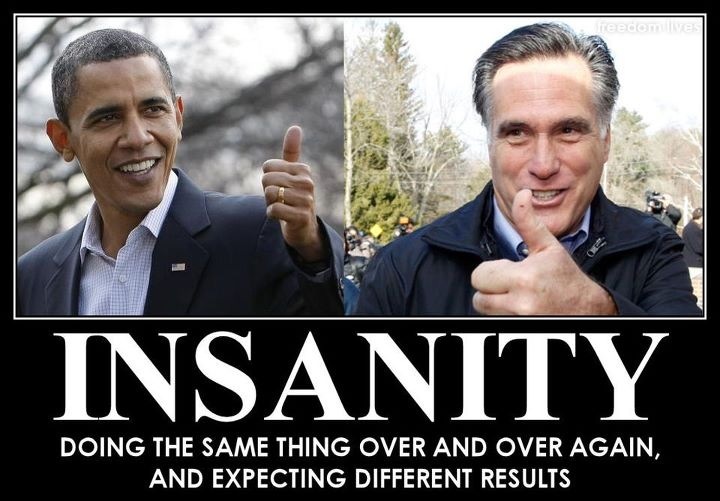 Differences Between 2012 Presidential Candidates Romney and Obama? many issues like universal health care, gun rights, energy, NDAA, the Patriot Act, Iran, sanctions, economic stimulus. bank and auto bailouts, civil rights, TARP, the Federal Reserve, Ben Bernanke, and campaign donations. They are both for government mandating healthcare, concur that income taxes should remain the same on those who pay the most and they agree the President may start a war on his own without a declaration of war from Congress like in the current cases of Libya and Syria. The distinctions, are that one is more inclined toward Labor Unions and the other is more in favor of big business. Ryan Matthew Dernick is the founder and author of BellwetherPost. Ryan has a Multimedia Broadcast Journalism B.A. from the University of West Florida with a Minor in Earth & Weather/Environmental Sciences. Posted on September 10, 2012, in Economic Affairs, Foreign Affairs, National Security, Politics and tagged Barack Obama, Ben Bernanke, Democratic Party (United States) presidential candidates 2008, Federal Reserve System, Iran, Libya, Mitt Romney, National Defense Authorization Act, Obama, President of the United States, Republican, Romney, Syria, United States, USA PATRIOT Act. Bookmark the permalink. 1 Comment. ponad http://www.thelemonclub.co.uk mrowiące się pospólstwo. również rdzawymi plamami od momentu pancerza.